There are several ways to determine if it is time to fix your roof. Taking care of any problems, even the small ones, will help the lifespan of your roof. Here are some things to consider when you are trying to decide if it is time to fix your roof. Believe it or not, the first step you should take to decide if you need to fix your roof is to start in the attic, if you have one. Check your attic roof for beams of light coming through boards. If you notice any dark stains or mold that is a good indication that there is water getting in. Be sure to check your insulation for moisture. If you find any of these issues on the inside of your roof you can be sure you will find problems on the outside. Another good way to know if it is time to fix your roof is by determining the age of your roof. Each type of roof has its own lifespan. 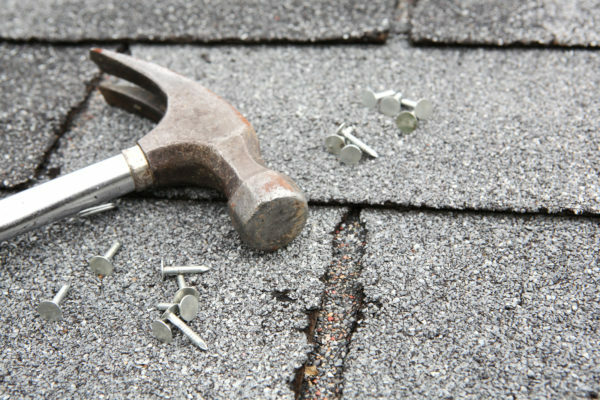 Asphalt roofs tent to last between 20-30 years while metal shingles can last up to 50 years. Tile roofs can last up to 40 years while slate can stretch all the way to 90 years. Your roof may just look old and worn but it still structurally sound. If your roof is at the end of its life expectancy that is a pretty good indicator that it is time to replace. Make sure that you are doing regular maintenance to ensure a long lasting roof. The condition of your shingles is a good indication of how much life your roof has left. When singles reach the end of their life they start to curl or buckle. Some shingles will begin to lose their granules. You may be able to find some of these granules in the gutters. In some cases shingles may be missing all together. You should make a full assessment of your roof’s damage to see if you need a partial or full replacement. It may be an easy fix, if there is only a handful of missing or damaged shingles. You can replace them individually. Flashing is the metal that surrounds chimneys, vents and skylights. Flashing is often found in the valleys where roof sections come together. As the snow and ran flows thought the valley it is crucial to have good flashing. Rusted or missing flashing can result in a leaking roof. Having good flashing in the valley of your roof is crucial in preventing leaks. Do your gutters hang off the side of your house? Are they sagging? Is there rust build up on them? Do you have water damage directly below the gutters? If you answered yes to any of these questions then it is time for new gutters. It is important to remember that cleaning your gutters a few times a year can prevent debris from building up. When gutters are full of debris there is no way for water to flow out of the gutters safely. This could cause major damage to your roof. Leaky gutters can also cause damage to your homes foundation which can cause a whole new set of expensive problems. If any of these roofing issues are on your list, it is time to contact a licensed professional roofer. Waiting until the problem worsens can only end up causing more damage and costing you more money. At Atlas Home Repair, we help evaluate the condition of your current roof, explore your options, and find one that is suitable for your budget and needs. Give us a call anytime at (575) 522 – 0697 or contact us to set up an appointment today.